Lighting up your desktop or side table during the night without bright overhead illumination is something basic need. With an aim of creating a unique and eco-friendly hydroponic product, Sven Growers brings a USB desk planter having hydroponic and lamp features, to brighten your room and you can see the roots of your plant grow in this awesome planter! Keep your desk plant healthy with a fully functional oxygen pump and make your room & office look great with this glowing lamp that grows your plant. It serves as an indoor micro garden from a large-scale vertical farm. This stylish and clean cut design with character planter will enhance the overall theme of your desktop. 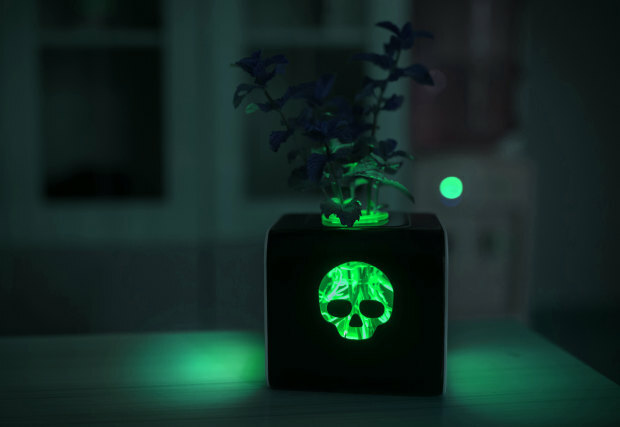 You will get a full hydroponic skull planter, with all pumps and lamps when you contribute to their Indiegogo campaign. The features include, a hydroponic pump that supplies oxygen on a 24 hour basis, full spectrum grow lamp, 3 color LED light inside to show the awesome roots of the plant, provision of any USB light into the planter for a lighting effect along with a dual USB slots to plug into a laptop, or wall outlet. This lamp looks really awesome at night; plug it straight into your laptop, or the wall.